The post contains affiliate links. This is an unsponsored post. All opinions are my own. 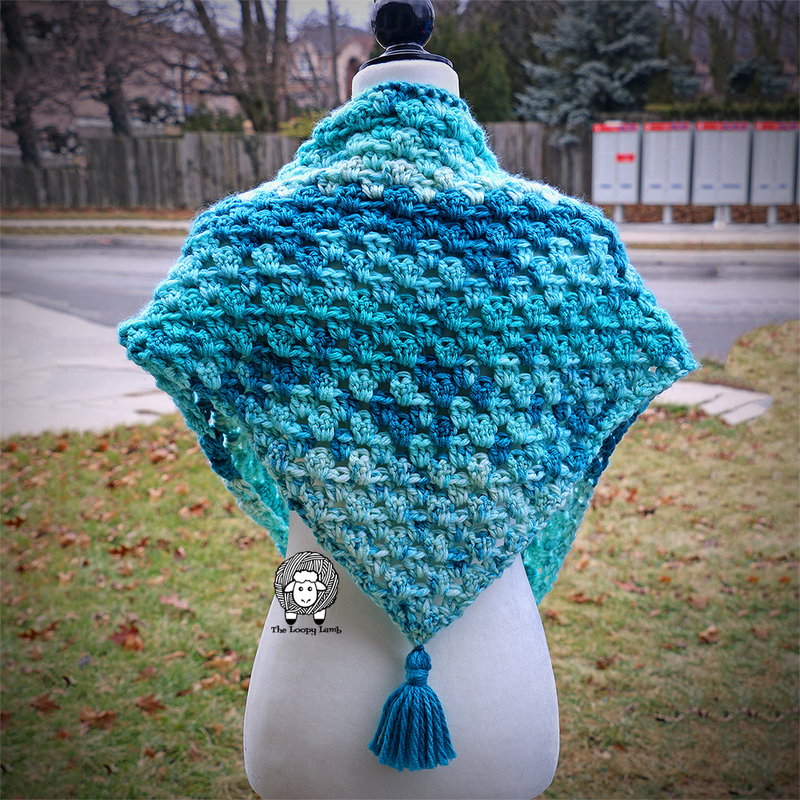 Confession: I have a bit of a weakness for self-striping yarns. It is so hard to resist a skein of yarn with a beautifully matched set of colours that allows me to be lazy with my colour changes. *drool* When I opened one of my Christmas gifts this year and found some Caron Chunky Cakes inside, I was VERY excited. I couldn’t wait to get my new squishy goodness on my hook. I had been having a hard time tracking down a 12mm crochet hook but my husband found one and gave it to be for Christmas. It’s my first Clover Amore crochet hook so I was obviously going to use this hook as soon as possible to test it out. 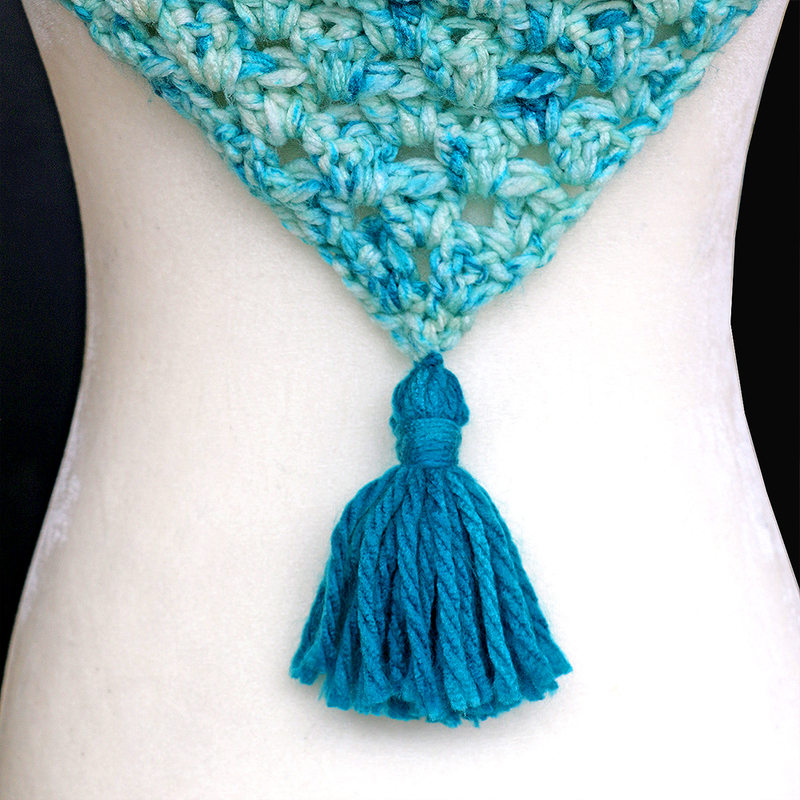 I had been looking for this hook to make a triangle scarf I’ve had in mind for a while. Now that I had my hook and a beautiful Caron Chunky Cake in Blue Moon, I was set to get started. 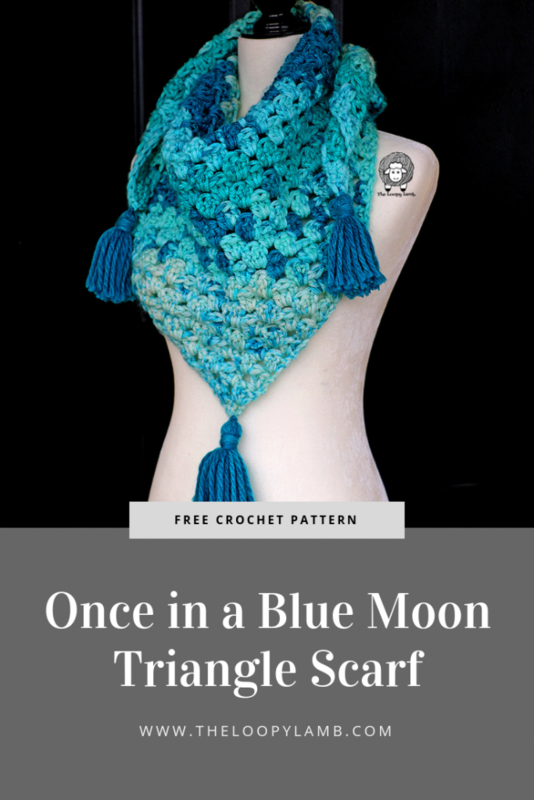 When I set out to design this pattern, I wanted to make a decently sized triangle scarf/shawl with a chunky yarn that only required 1 skein to complete. I also wanted to make my tassels from the same skein and for the pattern to be accessible for beginners. I am so pleased with the results! Finished size: 50 inches across longest side (not including tassels) x 22 inches wide in the center point (not including tassels) . 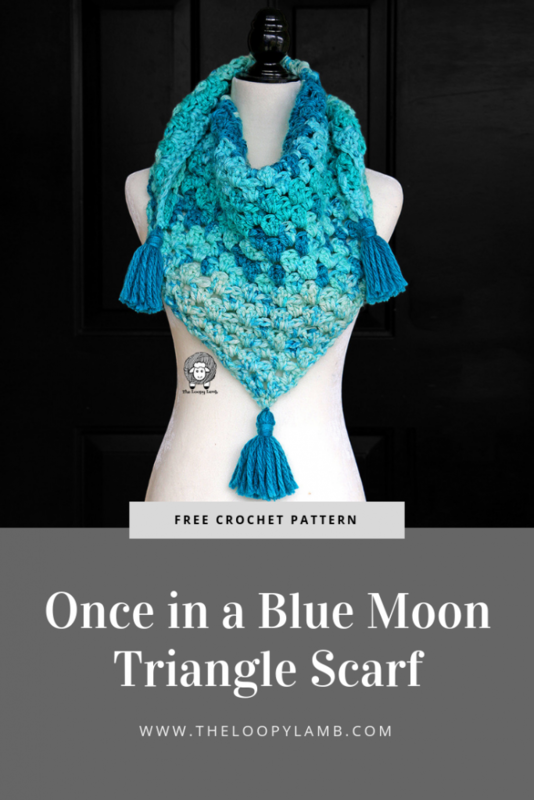 If you like this free pattern, please like, share and pin this post. 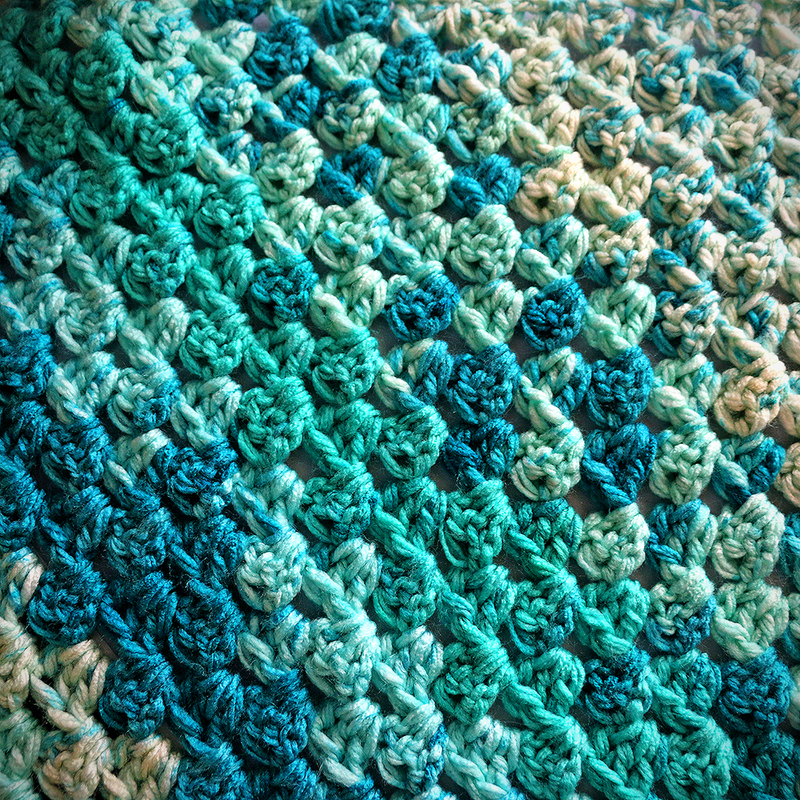 CH 3s at the beginning of each row count as a stitch. An ad-free version of this pattern can be purchase HERE. Row 1: Make a MC and DC 3 into the MC. CH 3 and turn. Row 2: DC 2 in the first DC. Skip 1 stitch. DC 3 in the last stitch. CH 3 and turn. Row 3: DC 2 in the first stitch. Skip 2 stitches and DC 3 in the space between the groups of DCs from the previous row. Skip 2 stitches and DC 3 in the top of the CH 3 from the previous row. CH 3 and turn. Row 4: DC 2 in the first stitch. Skip 2 stitches. DC 3 in each of the next 2 spaces the groups of DCs from the previous row. Skip 2 stitches and DC 3 in the top of the CH 3 from the previous row. CH 3 and turn. Row 5: DC 2 in the first stitch. Skip 2 stitches and DC 3 in each space between the groups of DCs from the previous row across. DC 3 in the top of the CH 3 from the previous row. CH 3 and turn. Rows 6 – 30: Repeat Row 5. Row 31: Repeat Row 5 but CH1 and turn at the end of the row. Row 32: SC in each stitch across and in the top of the CH 3 from the previous row. 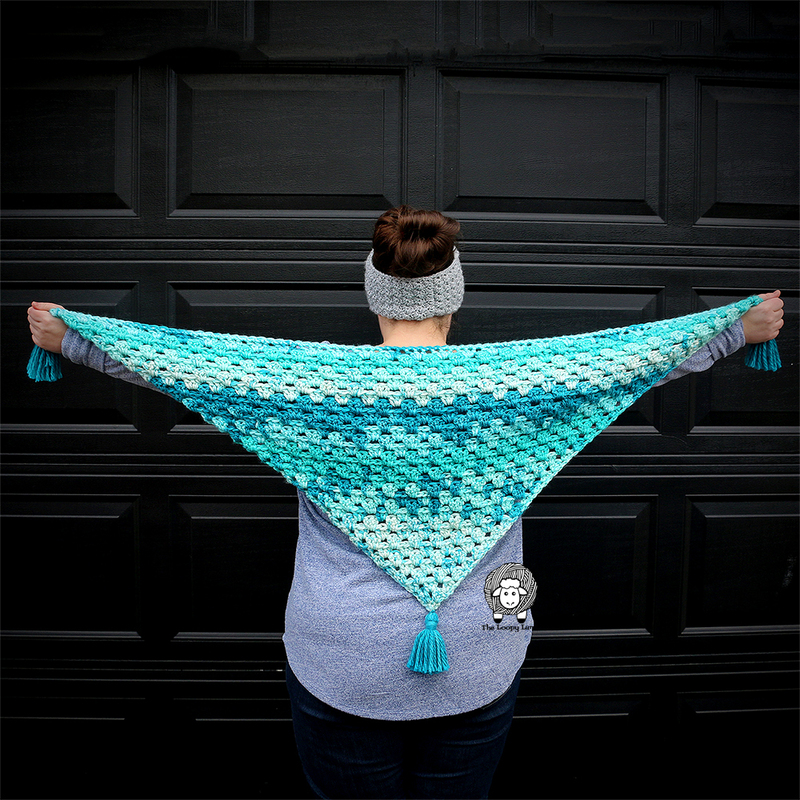 FO and weave in ends. Wrap the yarn around a piece of cardboard 4” wide approximately 20 times. Tie the top of the tassel with another piece of yarn to secure it (ensuring that it is long enough to attach it to the scarf. I used an 8” piece). Cut one side of the yarn that’s wrapped around the cardboard and remove the yarn from the cardboard. Take another length of yarn and wrap it around the top of the tassel 8 to 10 times tightly. Tie a knot and bury the end inside the tassel. Trim the tassel ends evenly. 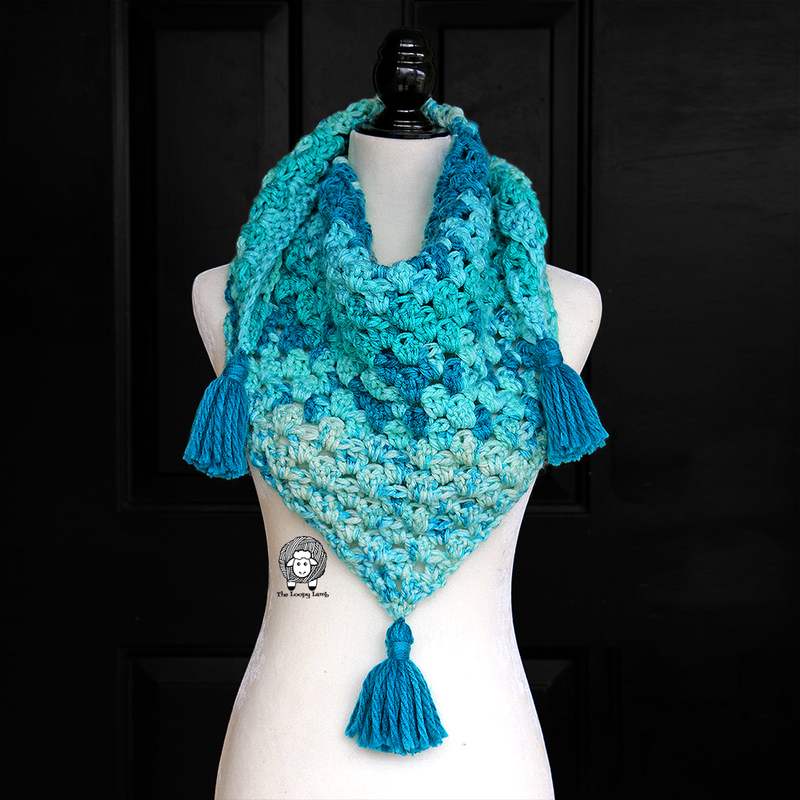 Attach a tassel to each point of the scarf securely. Feel free to sell the item created by this pattern but please provide pattern credit back to me when posting online, and please provide a link to my Etsy Shop: www.etsy.com/ca/shop/theloopylamb. Please do not resell, distribute, duplicate, or share this pattern in any printed or digital form, claiming this pattern as your own original design. Please do not use my photos when selling your finished items. Newsletter: Sign up for my newsletter! Love your pattern and talk about perfect timing! I’m trying to clean up my craft room and found one if the chunky cakes, not the same colour but now I know exactly what to make with it. ♥️ Thank you for sharing your passion and pattern.